Go rogue with your med ID! With patterned cutouts and flexible leather, our Rogue Medical ID Bracelet is a departure from the traditional in every way. Neutral enough to wear with anything and everything, this casual, comfortable med ID pairs with any custom-engraved medical ID tag from Lauren’s Hope, making it the ideal med ID for you no matter what your condition may be. Simply choose your med ID tag, and let us do the rest! As with all of our interchangeable designs, you can wear your Rogue Medical ID Bracelet with any custom-engraved Lauren’s Hope medical ID tag, keeping what’s truly most important to you right at hand. 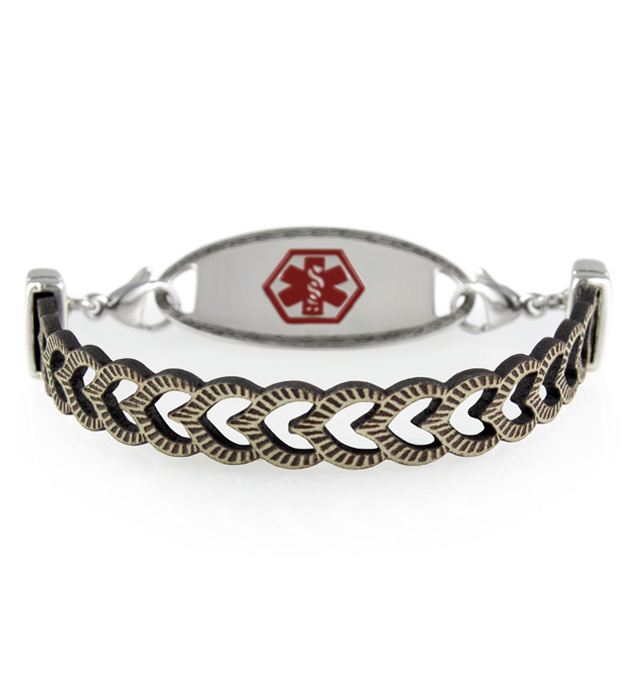 This on-trend med ID is a great choice whether you wear your medical alert bracelet for Type 1 Diabetes, epilepsy, heart conditions, food allergies (such as peanut, tree nut, soy, or wheat allergies) or for any other medical condition or treatment consideration. Custom engraving allows you to choose the look you want so you can stay safe in style.